Memorial Day weekend marks the unofficial kickoff to summer, and after the frigidly cold and snowy winter most of the country suffered through this year, we are especially blessed to now be welcoming warmer weather. Blessed and hungry. Say a temporary goodbye to heavy roasts and rich root vegetables, and hello again to refreshing summertime vegetables and your grill. With a seasonal focus on fresh veggies, this is a particularly apt time to consider the vegan diet, which eschews all meat, dairy and egg products—anything coming from an animal. What’s left to eat? Fruit, vegetables, grains, nuts, starches. One of the most famous adherents to veganism is actress and blogger Mayim Bialik, who can now add cookbook author to her resume (she also has a Ph.D. in neuroscience). Mayim’s Vegan Table: More than 100 Great-Tasting and Healthy Recipes from My Family to Yours (written with Dr. Jay Gordon; Da Capo Press) is a friendly introduction to the vegan lifestyle and seems particularly geared toward parents with young, picky eaters and little time to cook. Even if you’re a committed omnivore, like me, it’s hard to argue that adding more plant-based foods to our menus is anything but a positive. Bialik includes how-to’s from stocking a vegan pantry (rice/almond/soy milks, nut butters, canned beans, etc.) to swapping out dairy and eggs with vegan substitutes. Then there are the recipes. Bialik offers a range of herbed and spiced dishes that will satisfy and make you feel good about your eating. 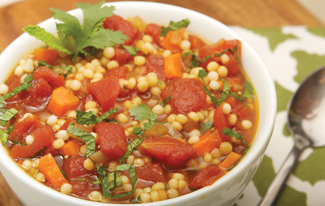 For a summer dinner, consider starting your meal with Tomato Soup with Israeli Couscous, preparing Thai Pasta for your main and finishing with Plum and Walnut Crisp. Hello healthy summer eating. It’s hard to come up with a Middle Eastern starter more colorful, zesty and healthy than tabouleh, made by Israelis, Lebanese, Palestinian Arabs, probably everyone in the Levant. Rawia Bishara offers a classic version of the mezze dish in her new recipe collection, Olives, Lemons & Za’atar: The Best Middle Eastern Home Cooking (Kyle Books). Bishara hails from a Palestinian Arab family in Nazareth, but moved to New York decades ago as a young married woman. She opened the restaurant Tanoreen in Bay Ridge, Brooklyn, in 1998, where she cooks up favorite dishes from her culinary traditions, with piquant accents like pomegranate molasses and seemingly ubiquitous squirts of fresh lemon to mouthwatering thick tahini sauce and multiple hummus preparations. The book is packed with photos of the Galilee—gorgeous landscapes, open-air vegetable markets, falafel stands, ancient seawalls and narrow alleys. Get ready to get hungry, with recipes from salads (fattoush, feta salad, eggplant salad) to lamb and chicken dishes, kafta stew, fish tagine, chicken kabobs and fried tomatoes. And while not all of Bishara’s recipes are kosher (skip over the shrimp recipe), most are, a plated manifesto to a natural, peaceful coexistence. While the Middle Eastern cooking Bishara features in her book all seems summer-seasonal, don’t pass up her Tabouleh and, for an exotic addition to the classic American barbecue, her Tanoreen Potato Salad, with fresh herbs, diced bell pepper, cumin, paprika and green olives accompanying the standard recipe. In ancient times, olive oil was a big deal in the Levant. It remains so today, and now it is also big business. Israel is the world leader in cultivation of olives for the specific production of fruit to be pressed into oil (the most popular olive tree planted for eventual oil production? The Barnea!). Israelis have exported their agricultural olive-growing know-how to countries from New Zealand to India. With olive oil in mind, the new primer on cooking with it from Mary Platis and Laura Bashar offers rich connections to our culinary ancient past and present. Cooking Techniques with Olive Oil opens with a history of olive oil production, with a focus on its Greek origins, a glimpse at the state of modern production and then differentiates between different varieties and how to store them. Then comes the fun part, how to cook with the liquid gold. Ever poached chicken breast in olive oil? How about tomatoes and onions? Platis and Bashar recommend it, and they’re right, the results are delicious. Try their Tomatoes and Onions in Olive Oil with Fresh Basil, a perfect summer side that will expand your cooking repertoire beyond sautéing, baking and grilling. 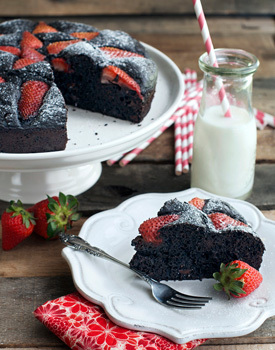 Platis and Bashar utilize olive oil for the expected, like their Greek Style Vegetables with Tomatoes, to the unexpected, namely their decadent, luscious Dark Chocolate Olive Oil Cake with Strawberries, which also calls for plain, nonfat Greek yogurt. The cake is gorgeous and delectable. It’s time to translate summer’s bounty into a flavorful, healthful menu delight. Dinner’s ready! Serves 4-6. From Mayim’s Vegan Table. 1. Heat the olive oil in a large pan, add the onion and carrots, and cook over medium-low heat for about 10 minutes until softened. Add the tomatoes, half of the garlic, vegetable stock, couscous, mint, cumin and cilantro. 2. Bring the soup to a boil, add the remaining chopped garlic, then lower the heat slightly and simmer gently for 7 to 10 minutes, stirring occasionally, or until the couscous is just tender. Season to taste with salt and pepper. Serves 4. From Cooking Techniques and Recipes with Olive Oil . 1. Heat oven to 375ºF. Line the bottom of a large ovenproof dish with basil leaves. 2. Place tomatoes and onions core side down in the dish so they are snug but not touching. 3. 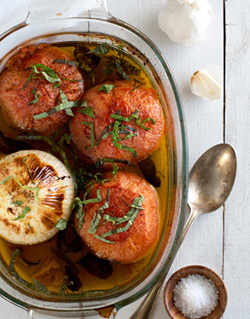 Pour enough olive oil to cover tomatoes and onions halfway up its sides. Add and submerge garlic cloves in the oil. 4. Bake for 45 to 60 minutes or until tomatoes and onions are soft. 5. Sprinkle with salt, pepper, and freshly sliced basil. 6. Slice and toast the bread and serve with the warm tomatoes and onions. Serves 4. From Olives, Lemons & Za’atar: The Best Middle Eastern Home Cooking . 1. In a large bowl, combine the parsley with half the tomatoes, the onion, fresh and dried mint, salt, lemon juice, oil and cracked wheat. Gently toss to evenly distribute the ingredients. Taste and adjust the lemon juice and salt. 2. Transfer to a serving bowl and garnish with the remaining tomatoes. Serve over the romaine, cabbage leaves or grape leaves. Serves 6. From Olives, Lemons & Za’atar: The Best Middle Eastern Home Cooking . 1. Place the potatoes in a large pot with enough water to cover. Bring to a boil and cook over medium-high heat until a toothpick slides easily into a piece but doesn’t cause the potato to fall apart, 7 to 10 minutes. Transfer to a colander to drain, then rinse under cold water. Spread the potatoes on a baking sheet to cool. 2. Combine the garlic and salt in teh bottom of a mxing bowl. Using a fork, mash the garlic into a paste. Pour in the oil and lemon juice with the parsley, scallions, green and red peppers, mint, cumin, paprika and black pepper; mix to combine. Add the potatoes and, using a wodden spoon, toss gently until thoroughly coated with the dressing. Transfer to a serving platter and garnish with the olives and cilantro. 1. 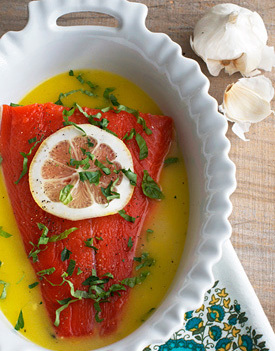 Place salmon in an oiled baking dish. 2. Mix marinade ingredients together and pour marinade on the fish. Let fish marinate for 30 minutes. 3. Preheat oven to 400ºF. 4. Place lemon slices on top of salmon. 5. Bake in oven for 15 to 20 minutes until fish flakes easily with a fork or has an internal temperature of 140ºF. 6. To prepare greens, add 1 teaspoon of olive oil to a large sauté pan and heat to medium. Add garlic and stir. 7. Add greens and sauté until wilted, about 5 minutes. 8. To make dressing place lemon juice, salt, and pepper in a small bowl. Whisk together. Slowly whisk in 1/4 cup olive oil until emulsified. 9. Mix dressing with greens. 10. Place greens and salmon on a large platter and serve. Serves 4. From Mayim’s Vegan Table. If you double this recipe or more, do not let the corn oil exceed 1/2 cup or it will be too oily. 1. Place the cooked pasta in a large serving bowl. 2. Heat the vegetable and sesame oils in a large skillet over high heat. Add the mushrooms, bell pepper, bok choy and carrot and sauté until the bok choy is wilted, 2 to 3 minutes. Add to the cooked pasta. 3. To make the sauce, mix together the corn oil, sesame oil, agave nectar or maple syrup, soy sauce and red pepper flakes in a small bowl. Pour into the pasta and veggies and toss to coat. Add the cilantro, scallions and peanuts and mix. From Cooking Techniques and Recipes with Olive Oil . 7. Allow cake to cool on the pan for 15 minutes; then gently run a knife along the side of cake. Carefully remove cake from the pan and transfer to a cooling rack to cool completely. Serves 6. From Mayim’s Vegan Table. To make the topping, combine the flour, brown sugar, cinnamon, ginger, salt and nutmeg in large bowl. Add the margarine and rub it in with your fingertips until small, moist clumps form. Mix in the walnuts. Cover and refrigerate 20 minutes. 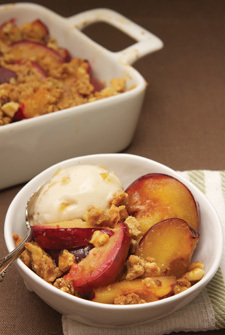 To make the filling, toss the plums, sugar, cornstarch and vanilla in a large bowl to combine. Let stand until the sugar dissolves, tossing occasionally, about 5 minutes. Transfer the filling to an 11 x 7-inch baking dish. Sprinkle the topping over the filling. Bake until the topping is dark golden brown and crisp and the filling is bubbling, about 40 minutes. Transfer the pan to a wire rack and let cool for 30 minutes. Note: Serve this crisp very warm, with a pint of vegan vanilla ice cream. You can give it a “homemade” touch by mixing in 1/4 cup of chopped crystallized ginger. Microwave the ice cream on low for 5-second intervals, just until slightly softened. Place in medium bowl and mix in the ginger. Cover and freeze until firm.